For over 30 years, LongHorn Steakhouse at 2892 North Druid Hills Road welcomed patrons. Last June, a devastating fire forced the closure of the restaurant and for months it sat, partially burned and dormant. This past February, the building was finally demolished, leaving only the trash area intact. "Our landlord for the Toco Hills restaurant began the demolition of the building this week. We expect the demolition process to take two weeks." 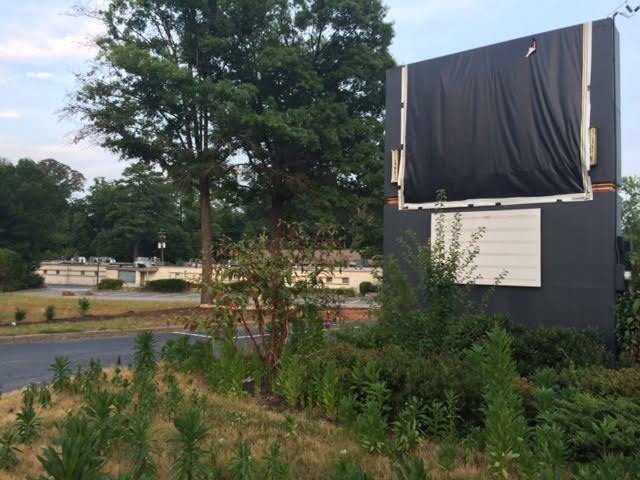 "The landlord is in the planning phase of rebuilding the restaurant. That’s all the information I have at this time." With far more than two weeks having passed and no visible work, I began to wonder if the restaurant would ever reopen. Amazingly, last week, a new variance request sign was placed at the property. The request, "Increase lot coverage and reduce parking to re-build a restaurant," seems to indicate that LongHorn wants to increase the size of the restaurant and reduce the amount of parking. 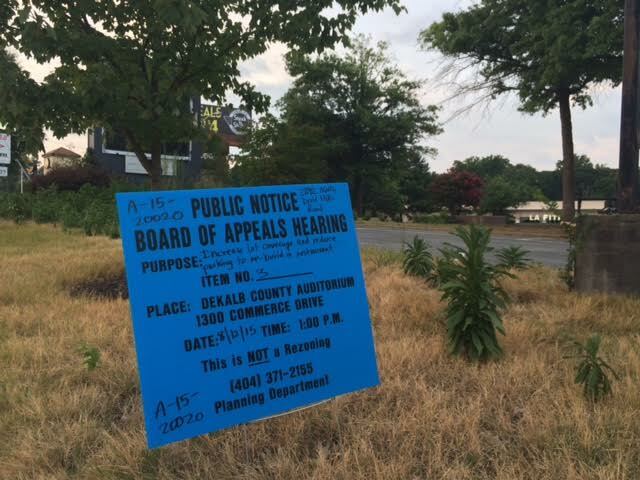 The public hearing is set for August 12th. I again contacted Ms. Schauer for comment. "The building owner is going through the variance process as part of the rebuild. We are confident that the plans will be approved and that the rebuilding process will continue as planned." No word on how much larger the restaurant would become or by how much the parking would be reduced. If all goes well, perhaps patrons will be dining at LongHorn by next spring? reducing parking indicates a willingness by owner.management to increase efficiency ( timely ordering - timely preparing - timely presentation of check ----this will turn the tables over faster reducing the need for more parking. How many seats/tables/booths and how many parking places were there before the fire?? From it's origin opening as Sambo's to Skeeters to Longhorn. Sambo's was similar to Denny's. Sambo's was one of the first targets of political correctness. Founded by SAM Battistone and Newell BOhnett, the name was coined by combining their names. However they embraced the assumed reference to Little Black Sambo. The fictional Sambo outsmarted attacking tigers, resulting in the tigers chasing each other in circles around a tree until they transformed into melted butter. By the late 70's, there were more than 1,100 Sambo's. None the less, some people considered the story pejorative. Combined with additional operational problems, Sambo's succumbed to bankruptcy protection. The empty building was also considered (but never realized) for Copperfield's which was n Atlanta area chain of bar/restaurants similar to Applebee's. Copperfield's died out in the late 80's. When Longhorn came knocking, they used the location to open their concept Skeeters, which grilled over Mesquite wood. Although initially successful, Skeeters was converted to Longhorns and continued operating until the fire. It's very possible that the building won't be any bigger than before and/or there won't be any fewer parking spaces than before. The previous structure could've violated the exact same codes (max. lot coverage and min. parking ratio) but was likely built prior to the enactment of the codes, so it was grandfathered until demolished or destroyed. Now, to violate those same codes with a new restaurant, variances will be needed. Very well said, BW. I was about to make the same comment and I'd bet that is what is happening. They didn't have many parking spots anyway. I never got the impression that it was too small and had lines of people waiting for a table. Can't imagine it would be any bigger.